Roadies Xtreme Last Audition Episode was completed in Kolkata on 01 April 2018. 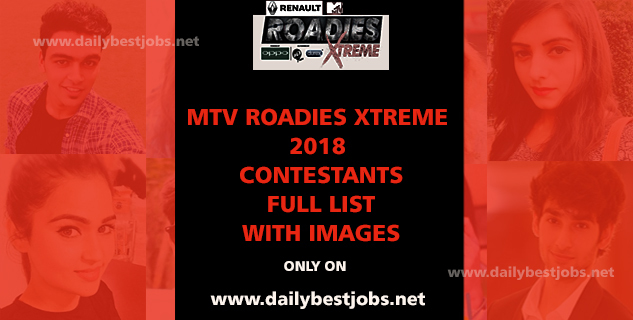 We made a list of Roadies Xtreme Contestants 2018 List Names with their images & teams who will fight in culling round. We are here provide you a complete list of MTV Roadies Xtreme Contestants List Names, Images, Teams, Gang Leaders, Sponsors, Timings & More. You can check all details to know about Roadies Xtreme Show from below. Roadies Xtreme is one of the best youth-based reality show which aired on every Sunday on MTV India Channel. At this Roadies Season going to be more extreme & powerful for all the selected Contestants. Here is everything you need to know about the MTV Roadies Xtreme 2018 show details, gang leaders, contestants, host, battleground registration, sponsors, & twists. Did You Check? 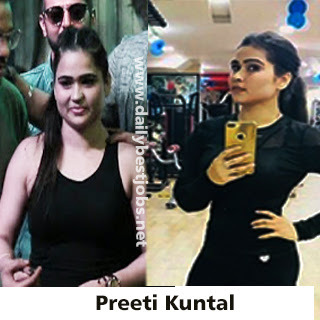 Supriya Gauniyal Images Who Finally Selected For Roadies Journey. Check out here names of Selected Contestants on MTV Roadies Xtreme Reality Show. After the end of PI Round, Rannvijay Singha has managed the Culling Round where he had Selected Top 20 Contestants for Roadies Journey. Look at their names of Top 20 Contestants Warriors who are finally going to the MTV Roadies Xtreme Journey. Also, two more other Contestants selected by passing Roadies Battle Ground Audition will get direct entry to join Roadies. Roadies Xtreme Finalists Contestants Names are Abhishek Dubey, Bibek Bora, Farha Fatima Khan, Geetika Sood, Kashish Thakur, Kriti Verma from Pune (GST Inspector), Pavneet Singh Bagga, Preeti Kuntal, Priya Sindhu, Rohan, Sandy Saha, Sayyad, Nishkarsh Arora, Sonu Jat, Samiksha Malik, Surbhi Rana, Shubhada Nishtala, Minni Rohilla, Shruti Sinha are the Top 20 Contestants. From another side, Nikav and Eram get a direct entry by challenging MTV Roadies Xtreme Battle Ground Auditions. We want to hear from you, Leave your reply in Below Comment Box. Who's Your Favorite Contestant and Who's Your Favorite Gang Leader? Rannvijay had selected the Top 20 Roadies Contestants and two others from Battle Ground Audition, the winner will directly Join the Roadies Journey. At this time, the Roadies Xtreme Journey task destination place is Shillong. Raftaar Singh (Rapper) New Gang Leader of Roadies Xtreme. Rann Vijay having some special powers in this new MTV Roadies Xtreme Season. There will be four teams in Roadies Xtreme 2018 Journey. The contestants will be select from four different teams that are Team Nikhil Chinapa, Team Neha Dhupia, Team Prince Narula & Team Raftaar. We are here waiting to watch that the participants of Roadies Xtreme 2018 will select in which team till you can Check here Vidit Sharma Audition Selection Sad Sister Story. 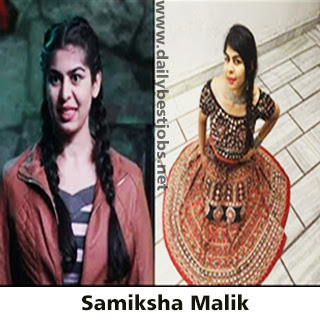 We share with you here MTV Roadies Xtreme Contestants 2018 complete names List with their Images. Let's check out who is going to participate in Roadies Cunning Round & selected for Roadies Journey 2018. 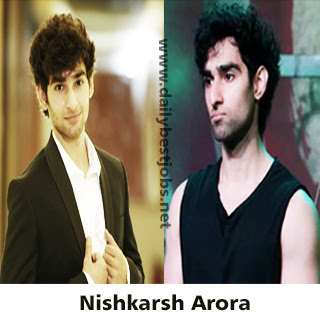 Neha Gangs, Contestants name will be updated here soon, check later. In Prince Gangs, Contestants name will update here soon, check back. Nikhil Chinnapa Gang Members name will be updated here soon, keep checking back. In Raftaar Gangs, Contestants name will update soon, stay tuned. If you still didn't watch a promo of Roadies Xtreme 2018 can check here on Youtube link. (iv) Every Participant shall have a valid four wheeler driving license. (vi) Each participant shall have in their possession one of the valid legal document as mentioned below to prove his or her age Driving license or Voters identity card or School leaving certificate or Birth certificate or Ration card or Passport. Check here Roadies Xtreme Terms & Conditions For Audition Selection & Battleground Journey. If you are still interested to participate in Roadies Xtreme Battleground 2018 and ready to face tough challenges and have full strength to put efforts and take risks to participate in this show. Then, don’t miss this last chance to be a roadie, they are giving the last chance for all participant who is yet want to be part of the Roadies Xtreme 2018. Just send your video to show your performance in 15 seconds that which show Xtreme enough to become a Roadie, and may you will be the next Roadie if selected. For all new participants requires sharing their video on Facebook or Instagram by using a tag of #RBG2018 to MTV Roadies. Another option to take participant by sending Xtreme videos through email id on rbg@mtvindia.com. All shortlisted participants will be contacted soon & assigned for a task which will go live on Facebook also. You have to pass this 2 challenges in 2 minutes, & within 15 seconds to do complete every task. Know More About MTV Roadies Xtreme Battleground Auditions, Registrations & Venues Details, Or Download Roadies Xtreme Audition Form 2018. There are two best options to watch MTV Roadies Xtreme 2018 full episodes from MTV India TV Channel & Online streaming MTV Roadies Xtreme Episodes only on Voot website. In this season, there are many new twists added in this MTV Roadies Xtreme Show. As before Rannvijay was gang leader who is everybody's favorite is no more gang leader for this season but he has some special powers & part of roadies Xtreme. Raftaar Singh, music industry rapper is a new gang leader in this show and also a fresh face for the audience & viewers. Harbhajan Singh was part of this show at last year but he will not be seen this year. This season of roadies will be more exciting & thrilling as some new challenges & tasks designs. So, overall this season of roadies will be going to be more extremely exciting with the Xtreme twists & fun. MTV Roadies Xtreme hosted by Gaylene & Benafsha Soonawalla who were participated last year in Bigg Boss 11. This year of Xtreme season of roadies will be also hosted by Gaylene Mendonca as she hosted last year. You have to must check this How to prepare For Roadies Auditions & Selection For Xtreme Journey 2018. So, this is all about MTV Roadies Xtreme Contestants 2018 List Names With Images, Roadies Xtreme Contestants List, Roadies Xtreme Contestants, Roadies Xtreme Contestants 2018, & Roadies Xtreme List 2018. Subscribe your email id for the latest updates related to MTV Roadies Xtreme 2018 & Stay tuned for our updates. 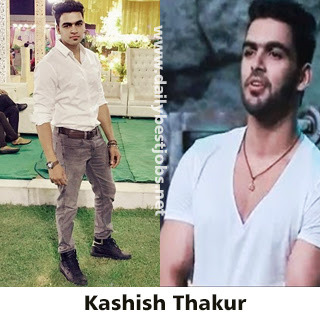 Related Tags: MTV Roadies Xtreme Contestants 2018, Roadies Xtreme 2018 Contestants Names List with Images, MTV Roadies Xtreme Contestants Boys Girls Names List With Pics, Roadies Xtreme Contestants with Gang Leaders Team Names.